The U.S.S. 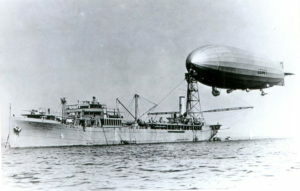 Shenandoah, (ZR-1), was the first of four giant rigid airships built for the United States Navy to be used for fleet reconnaissance. The other three airships included the U.S.S. Los Angeles, U.S.S. Akron, and the U.S.S. Macon. When completed in August of 1923, The Shenandoah was 680 feet long, and 78 feet 9 inches wide, and capable of carrying seaplanes. In July of 1924, the U.S.S. Patoka was modified from a fleet oiler to an airship tender with the addition of a 125 foot tall airship-mooring-mast attached to the aft section of the ship. On August 8, 1924, the Shenandoah and the Patoka came to Rhode Island to conduct airship-docking-tests in Narragansett Bay. The Patoka anchored in the bay just off Prudence Island in an area where the effects of the changing tides were the lowest. The Shenandoah, dubbed the “Queen Of The Air Fleet” by the press, cruised in the vicinity for several hours as thousands lined the shoreline or set out in pleasure boats to watch. Finally the Shenandoah glided to the Patoka and three lines were tossed from the nose of the airship to sailors waiting atop the mast. After the lines were secured, the Shenandoah was slowly drawn nose-first to the mast by a series of winches. The following is an excerpt from the Woonsocket Call (R.I.), newspaper dated August 9, 1924 which describes the docking procedure: “The Shenandoah’s crew, cooperating with the sailors below, nursed the big airship toward its resting place by using the engines in the two forward gondolas intermittently. At times the Shenandoah’s nose would dip rather sharply. An even keel would be resumed in a short time as the stern settled. Water Ballast was discharged on two occasions. The entire operation took about an hour. Once secured to the Patoka, 37 crewmen of the Shenandoah climbed down through the mast to the deck of the Patoka. The whole purpose of the test was to see if anchoring an airship at sea was feasible. The test, the first of its kind ever attempted by the navy, was a success. It was also reported in the Woonsocket Call that the Shenandoah had flown over Rhode Island the previous autumn. The Shenandoah was lost on September 3, 1925 when the ship encountered severe weather while passing over Ohio. 14 of the 43 crewmen aboard were killed.